Bask in the retro 80’s glow of Malibu Days, mixing monochrome stripes with a saturated pastel print featuring palm silhouettes. With a variety of swim styles and coverage levels to choose from, there is something for everybody, so make this your own. 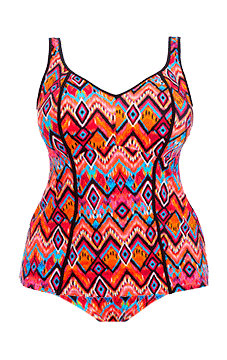 Tribe Vibe’s contemporary geometric design was inspired by ethnic patterns and tribal rhythms. 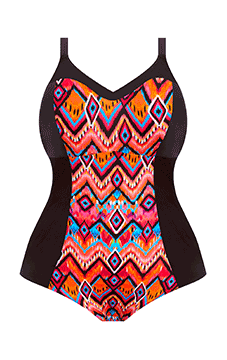 Hot shades of pink and orange contrast with turquoise and white highlights for a real fun-loving swim look.